The Pineapple Express is located a 5 minute walk from the main street, you're in a quiet environment with a spacious garden and rooftop. There's a huge choice of paid breakfast every morning, super fresh and delicious. The beds are clean and the matresses are top-notch! 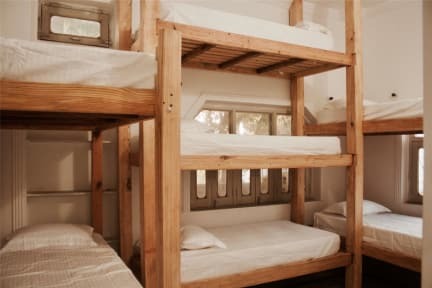 There are enough shared showers and toilets, laundry service available. Every evening there's a bonfire and you can order food as well. The staff consists of both locals and travelers and they are super helpful and friendly. I loved my stay at The Pineapple Express. The staff is amazing and super friendly, the atmosphere is really great. Such a lovely hostel! We absolutely loved our stay here and ended up staying for two nights longer. The staff are so nice and something’s always going on. It’s a bit of a short walk to town but worth it. Would definitely recommend!!! My time at Pineapple Express was bloody brilliant, great food espieccially the French fries which are big and the lassis where very nice had a great bed, great place to chill. We are coming back this weekend as we loved it so much. 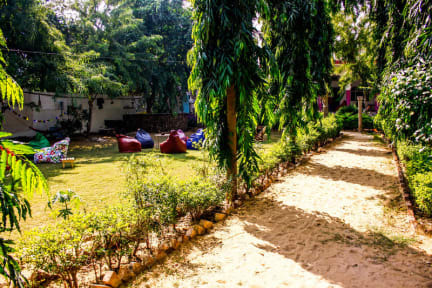 A very chilled out hostel, with a nice outdoor area. A bit away from the main city area. The 12 bed room was pretty basic but clean and the shower was one of the best I've had in India. Staff were very friendly and the evening bonfire was a nice touch to bring people together. A very good place to relax and meet other travelers. Very nice and helpful staff. Delicious breakfast and dinner options. Great offer for extra activities - horsebackriding, hiring a motorbike etc. Bathrooms could be cleaned a bit more frequently. Not real close to town, but totally walkable. That was part of the charm. It had a real nice relaxed atmosphere. Good food, great advice and dining/travel suggestions. Great help getting to our next destination. Rooms are not so clean.